Aria… Blast from the past. My first playable guitar was Aria brand back in early 90’s. The blue pearl Ibanez RG series ripoff. This old school fuzz unit is kind of ripoff too. Closely based on EHX Big Muff Pi, minus output buffer. All caps are ceramic in original RE-203, and my layout is designed to easily accommodate 2,5mm 560pF ceramics and 5mm raster caps for anything above. You may bitching me for stand up resistors again, bud hey! RE-203 have them all that way. If You like Meathead tones but You need more knobs – here it is! D*A*M Meathead Deluxe with added Filter and Fuzz control. Still angry beast but more controlable. Layout of this pedal is very similar to Drag’N’Fly and Super Bee – beacuse all of those pedals are based on fuzz face circuit with changed components values. Another cool fuzz pedal from D*A*M – Meathead! This name should tell evrything… Brutal silicon fuzz tones with big muscles. This pedal wasn’t designed to be nice 🙂 but to destroy! Only one control, but lot of fun! Simple but effective! This pedal really can kick Your amp! You have been warned! So be carefull! 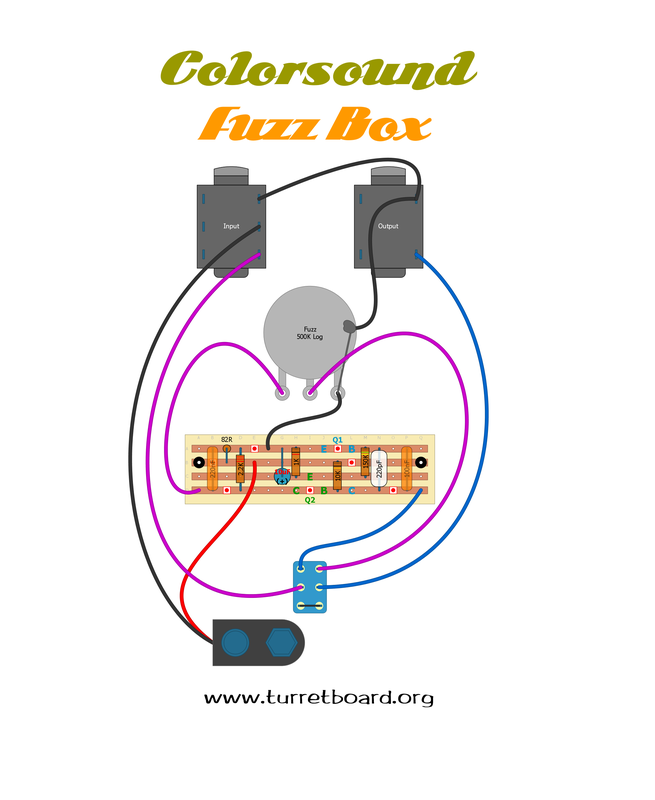 Circuit is based propably on Colorsound Fuzz Box (aka. One Knob Fuzz) with few tweeks to give it more power and midrange. It doesn’t have instant clean up as good germanium fuzz face, but it still response very well for guitar volume knob and picking strength. I really dig it! It’s quite simple build without expensive mojo components, so it’s great project to start building pedals. There where many versions of this pedal (Dark, Bass) but usually where changed only input and output caps. Will post more layouts for other versions in following days. Now it latest version called M-13. Hmm… Germanium or Silicon powered fuzz…? That is the question. Hey… why not both at the same time? 🙂 D*A*M answer is Drag’N’Fly! 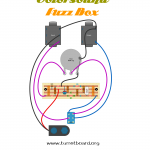 Hybrid fuzz box based on Fuzz Face circit with increased gain and output, silicon flavour and touch of germanium warm. Temperature fluctuations stable. 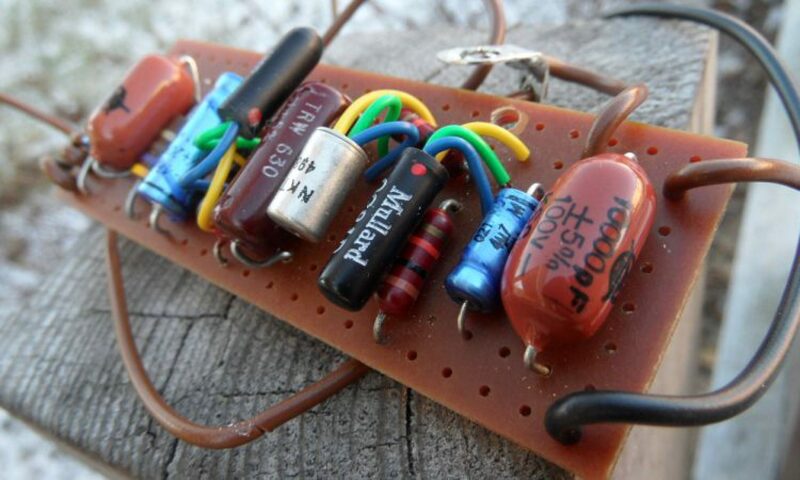 Input filter (blend between two capacitors) allows to add exactly as many bottom end as needed. Very interesting concept. Personally I don’t like input cap blend and prefer solution based on switch between two or three input caps, but many folks likes it – worth trying for sure. Here’s another D*A*M take on classic Vox Tone Bender circuit – Super Bee SB-66 which evolved from Super Bee mode in 1966 pedal. Main change in cicruit – here we’ve got fixed input and output 100nF caps which results deeper tone focused on lower mid range. You can play with those cap to get darker or brighter tones. Also… You can change Level pot value – personally I preffer 100K or 250K over stock 470K which is little to dark for me. This is really cool pedal – pure germanium fuzz tones! First of all – Really Big Thanks to Sinner for inviting me here on turretboard.org! It’s really a great honor for me. So… Here’s layout for last version (from 2010 I think) of sadly discontinued D*A*M 1966. What it is? Vox Tone Bender replica! 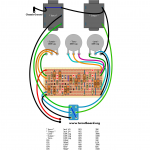 In nutshell Vox Tone Bender share almost the same circuit as Fuzz Face, D.A. Main additionaly has introduced few tweeks which allows to achive different sonic possibilities. Main change – added switch between ’66 and Super Bee mode. ’66 gives You classic Vox Tone Bender vintage vibes – very raspy and angry tones. Super Bee mode adds more bottom end and volume. In this version Super Bee mode works little different than in previous 1966. 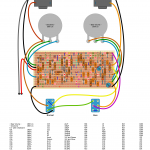 In 2010 version – switch changes resistance of Level pot by adding in parallel 47K resistor, in previous version (will post layout in following days…) switch is changing output capacitor. Additionaly in 2010 version bias trimpot was moved and now it allow to bias Q1 collector and Q2 base at the same time – according to D.A. Main “It does that clean up thing betterer and is more temperature stable“. OK… at the moment it’s all. Will update this project page soon for sure! And one more thing… If You ever will have possibility to get D*A*M pedal – I highly recommend those beautiful dirt boxes. Work of David and Linzi are always top notch! It’s smallest I could go, and at this point unverified. Here it is – Discontinued D*A*M Professional MKII. It’s almost stock Tone Bender MKII variant, but with Q2 bias adjustment control and Q1 base to ground resistor changed from 100k to 10k. Simple and effective build, recently reissued by D*A*M/Macaris combo. In recent reissue D.Main is using BC109C NPN silicon transistor (BC109 in DAM reissue) in first stage (Q1), and higher gain selected BC108C for Q2.